Shine Spa for Sheraton has been praised for its signature services and treatments which are exclusively available at the Spa and are guaranteed to take the relaxation quotient to the next level. 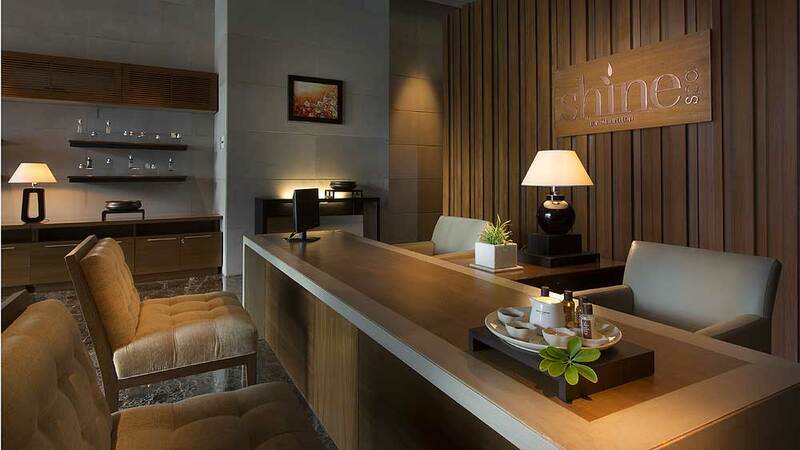 Shine Spa for Sheraton is a paradise for body spa enthusiasts, reinventing and revolutionizing the meaning of service and experience for spas in Bangalore. It provides authentic, memorable experiences based on following unique qualities it possesses. “The guests are increasingly seeking the spa experience as an alternative or to complement their well-being, fitness or other leisure activities. Mostly corporates as well as leisure guests use it to relax and de-stress. We have many in-house members and city guests (nonresidents) who come to experience our services,” said Mahesh Lal, Spa Manager, Shine Spa at Sheraton Grand. Out of 10 treatment rooms 09 treatments rooms are attached with shower and toilet rooms. Beyond providing a respite for physical rest, relaxation and recovery, we protect the serenity of the spa environment at all costs. Each treatment begins with a foot ritual meant to bring peacefulness which is also unique to Shine Spa. Alleviate tension as lavender fragrance massage oil is lightly poured onto your body with customized massage strokes. The essences are smoothed onto the skin, leaving it glowing, nourished and hydrated. Enveloped in a subtle fragrance, you’ll experience complete physical and mental relaxation. This intensive treatment with phenomenal benefits: Oxyzomes. Featuring an outstanding, targeted delivery system, it releases vitamin C into your skin throughout the day. Powerfully formulated with hyaluronic acid, it works to visibly repair and smooth the skin, reduce the appearance of wrinkles, and increase oxygenation. The immediately visible result is a more youthful appearance and radiant glow. An immediate solution to recapture a youthful body! It combines two iconic spa therapies into one unique professional spa treatment to tighten, firm and infuse the skin with long lasting radiance.This glowing head to toe body treatment consists of body elixir, micro massages gel, body wrap, and luxurious body moisturizer. The spa associates are trained to be sensitive to guests’ individual needs, and every interaction ends with the spa representative offering to answer any remaining questions. Guests are personally guided throughout their experience, and staff members are trained to answer questions and look for ways to address the needs of each individual with their remarkable spa skills. Shine spa for Sheraton is maintaining Global Starwood spa standards and the same are updated every year by the corporate team to ensure its trend matching with superior quality service, practice and products. Achievement of budgets and increment spa membership on monthly basis shows a very positive graph of Shine spa for Sheraton. Using social media for promotion is just a way of communicating to everyone about what the ongoing offers and trending treatments according to the season are at Shine Spa for Sheraton. In my opinion what really works and speaks louder is word of mouth in response to quality service and products our guests receive. We focus on updating products, facilities and services to flow with the latest lifestyle trends more than focusing on competitors. In terms of guest satisfaction as well as financial achievements Shine Spa for Sheraton performed exceedingly well.We aim to provide the best services with quality products and facilities aiming at superior guest experience this year as well. Get adorned in luxury of The Pink room spa..